I used to think of stews as comfort food – to be eaten on a cold or damp winter’s day but we ate this on a glorious summer evening in mid-July, sitting in our garden as the sun was slowly sinking down behind some trees, and it was absolutely perfect. It is also an ideal dish to pop in the slow cooker whilst you are busy buying/wrapping/cooking and generally getting ready for Christmas. 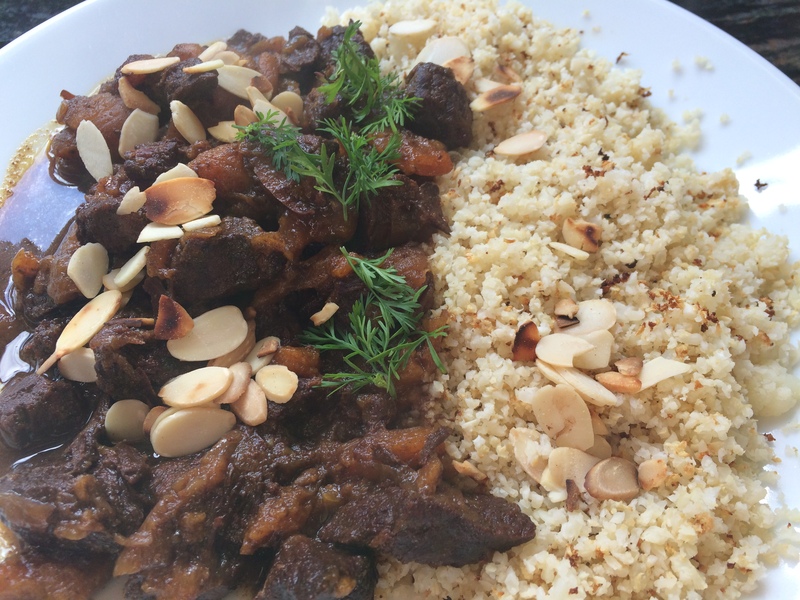 This is a delicious beef stew with a difference; it’s spicy yet sweet. I served mine with cauliflower rice which I had roasted in the oven and the match was made in heaven! Cauliflower rice can be cooked quite a few ways but I like the slightly nutty crunch of when it has been roasted for ten to fifteen minutes in a hot oven. I also keep bags of ‘riced’ cauliflower in the freezer for just such an occasion as it can be roasted from frozen. As a last minute thought, I toasted some almond flakes in a pan and sprinkled over the dish for that extra bit of crunch. Cook the onion in the oil in a large fry pan for about 5 minutes, until soft. Add the salt, pepper, cumin, cinnamon and ginger and cook, stirring continuously, for another minute. Add the wine and simmer for one minute, scraping up any sediment from the base of the pan. Transfer the mixture into a slow cooker. Add the beef, apricots, honey and water and stir well to mix. Cook on HIGH for 6 hours or on LOW for 9 hours until the meat is very tender. Serve with rice, couscous or cauliflower rice, garnished with fresh coriander. This entry was posted in Dinner and tagged apricots, Braising Steak, Cauliflower, Dinner, Gluten Free, Healthy Eating, Lunch, Slow Cooker, Spices, Wheat-Free. Bookmark the permalink. I’ve done a pork one but I reckon lamb would work just as good.